Any of these critters that have such iridescence are incredible! Gotta love Mother Nature! Ray: Nature is wonderful and diverse. Ray: One of the most colourful and entertaining of garden dwellers, Astrid...but, tiny! His iridescence fascinates me, Ray. I suppose Mother Nature has a reason for it...other than for the sheer beauty of it? Ray: A tiny beast, Ginnie, but he catches the eye. It's the amazing iridescent body that does it for me. If only I could have my car sprayed thus..
Ray: Now that would be a car worth seeing, Chris. Not the prettiest of things despite its effort with its wings. Must try harder. Ray: A successful beast, Alan, so the costume seems to be working. Ray: He is a colourful package, Lisl...with these two images I was concentrating on the wings, but the body and eyes are also attention-grabbers. Magnifique couleur pour cette petite bête ..
Whoever thought of the name fly was a genius Ray. Ray: I hear you, Chad. That person might have called us walks. 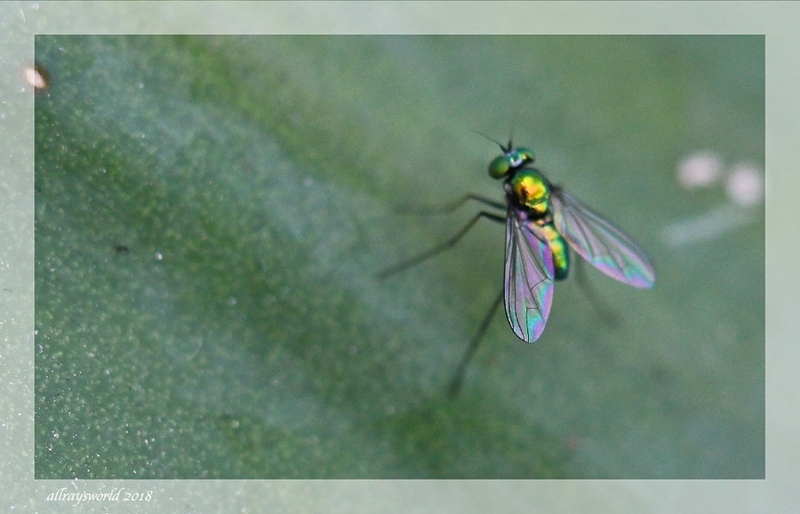 I love the fluorescent body of this fly - what a variety of inhabitants in your gardne! Ray: I doubt I could count the species of animals in the garden, Philine. I have sheets of glass identical to it's wings. I will take a shot sometime. There is a fishing fly that looks like this - never had much success with it. Ray: The fish probably think it is metal, Louis. Ray: Its eyes are stunning objects, Larry. Ray: A tiny critter, Bill, but he surely knows how to get attention!